Say hello to the latest addition to our product range: the Invoxia Voice Bridge. 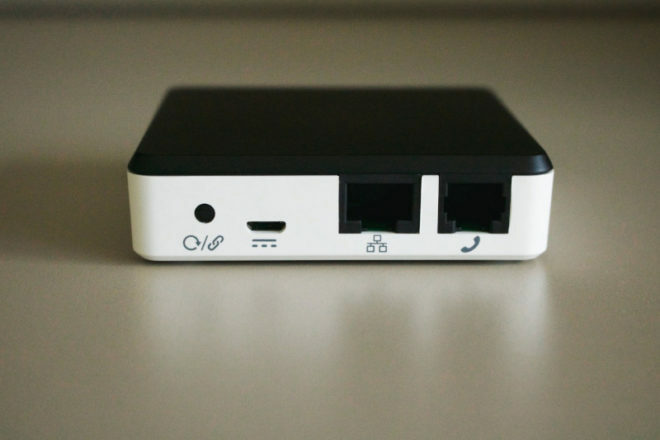 This neat device lets you take your landline with you anywhere, via your mobile phone. Sounds too good to be true? We put the Voice Bridge through its paces, and you can find out what we thought below. 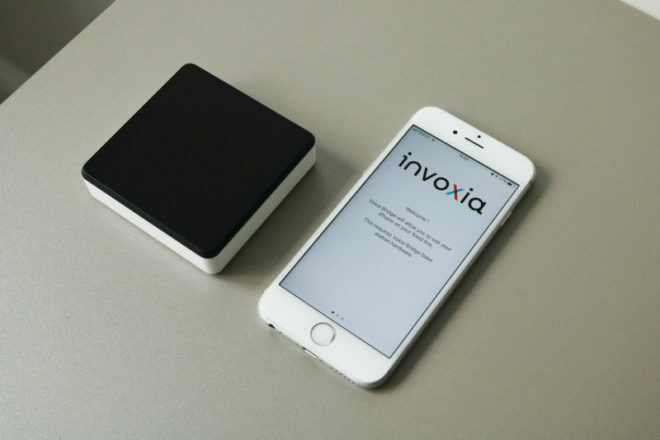 Just how does the Invoxia Voice Bridge work? If you’ve ever wished that there was an easy way to answer landline calls when you’re out of the house, then the Voice Bridge is just what you’ve been looking for. It essentially allows you to use your mobile as an extra handset for your home phone. This is done through a free app that’s super-simple to use. So long as you're connected to the internet via WiFi or your mobile data, the Voice Bridge does a reliable job of pushing incoming landline calls to your mobile, wherever you might be. Your landine handsets will ring as well, so you still have the option of taking calls through them, too. The main advantage of the Invoxia Voice Bridge is the fact that it’s incredibly easy to use. So long as you have a smartphone with either iOS or Android, anyone can use it! It does more than just let you take landline calls from your mobile, too. You can also phone people from your home number on the go. This is perfect for business owners who want to use their work number, but aren’t always in the office to do so. It's also a major advantage over standard call forwarding services. We were a little disappointed at the lack of any extra features beyond this basic functionality. But the Voice Bridge doesn't pretend to be anything it isn't. Instead, it does one thing, and does it well. Minimalism is the order of the day here. Take the Voice Bridge out of the box, and you’ll be met with a sleek, shiny unit. Aside from the connection ports at the back, the only notable feature is a light on the front that tells you the unit is switched on. Invoxia have clearly taken a leaf out of Apple’s book here. That means it won’t be out of place in any modern home, so don’t feel you have to hide it away in a drawer somewhere! 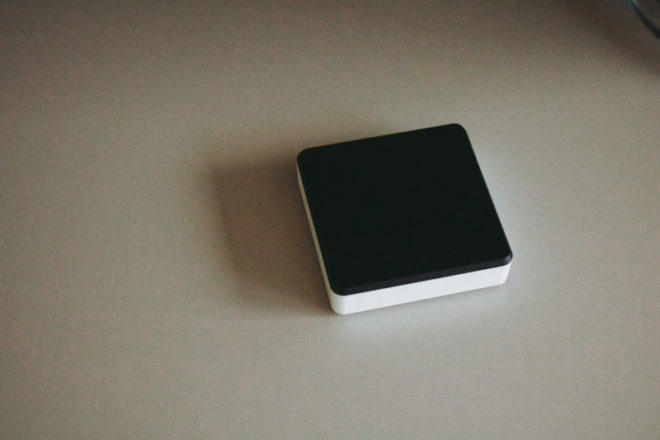 Size-wise, the Voice Bridge is roughly the size of a coaster, and stands an inch or so tall. Despite its size, there's still a fair bit of weight to it, so it feels nice and solid. There's also a set of rubber feet on the bottom, so it's not at risk of getting knocked off your side table accidentally. You might think that such a fancy piece of tech would be complicated to set up- but you’d be wrong. There aren’t endless wires to attach, and you don’t need to be a phone technician to get the Voice Bridge up and running. Just plug it into the mains and landline, and connect it up to your home WiFi. All that’s left to do now is download the Invoxia app on your smartphone and pair it with your Voice Bridge, and you’re done. There's even a setup wizard to guide you through this step, which we found very useful. If you want to dig into things a little more, then you also have the option of syncing your address books between devices. In addition, you can sync up to five different smartphones or tablets to a single Voice Bridge, so the whole family can use it. How does the Invoxia Voice Bridge perform in practise? At liGo, we like to test products out before we offer them up to our customers. We want to make sure they're up to our high standards- so we put the Voice Bridge through its paces. After setting a unit up in our office and installing the app, we took turns trying it out with our smartphones. For the most part, the Voice Bridge works well. The app is quick and responsive on iOS, although we found it could be a little slower on Android. As for sound quality, this really depends on the quality of your internet connection. When hooked up to the office WiFi, calls sounded okay, albeit not quite up there with a good-quality cordless handset. On the other hand, things were a bit more hit-and-miss when using mobile data. We'd advise that you try to use the Voice Bridge app with at least three bars of mobile signal. Otherwise, we found that the sound could occasionally drop in and out whilst on a call. Don’t be fooled by its humble appearance. The Voice Bridge is actually a very clever piece of tech indeed. Within minutes of taking it out of the box, you’ll be ready to start making and taking landline calls from pretty much anywhere with a mobile signal. While it would have been nice to see some more in-depth features, and there are a few bugs to be ironed out, it is at least satisfyingly user-friendly. Best of all, it really does work as promised- something you can’t always count on from tech. This entry was posted in Reviews, Accessories on 13/02/2019 by Daniel.